Immediate implant placement in the aesthetic zone has become a controversial topic with regards to the long term aesthetic demands that both the profession and our patients have placed on this treatment modality. Since the controversy broke a few years ago there have been a number of outstanding developments that have revolutionized the way we do immediate implant placement. Soft tissue augmentations using the tunnel technique as well as the socket whiled technique are 2 of these techniques which form the baseline of treatment in our clinic. This lecture will go through all the updated protocols of immediate implant placement supported by the literature as well as deal specifically with the finer details of the socket whiled technique including step-by-step photos and video of the technique. More importantly it will cover numerous complications that we have had to deal with over the last few years that we have been doing this technique. Learn step-by-step technique to soft tissue augmentation utilizing the tunnel technique and the socket shield technique. How to manage complications utilizing these techniques. How to approach single implant sites, multiple implant sites and other thin gingival morphotypes in the aesthetic region. Delayed vs. Immediate implant placement. Where to leave the height of the socket shield to buccal bone. How to manage the "jump gap". Immediate implant placement in the aesthetic zone has become a controversial topic with regards to the long term aesthetic demands that both the profession and our patients have placed on this treatment modality. Since the controversy broke a few years ago there have been a number of outstanding developments that have revolutionised the way we do immediate implant placement. Soft tissue augmentations using the tunnel technique as well as the socket whiled technique are 2 of these techniques which form the baseline of treatment in our clinic. 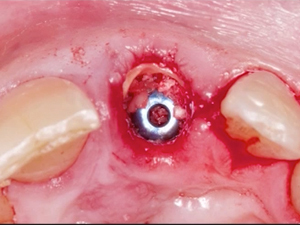 This lecture will go through all the updated protocols of immediate implant placement supported by the literature as well as deal specifically with the finer details of the socket whiled technique including step by step photos and video of the technique. More importantly it will cover numerous complications that we have had to deal with over the last few years that we have been doing this technique.